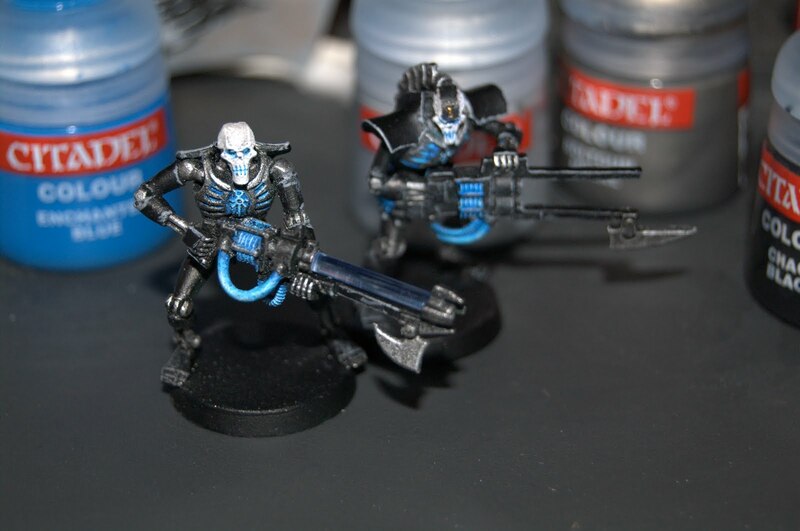 Today, I started working on the prototypes for my Necron Warriors and Immortals. I was going for a variation on the Thokt Dynasty paint scheme as I wanted something different from the typical metal & bright neon green look. 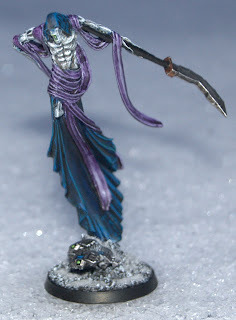 I also think this theme will go well with the snow bases. 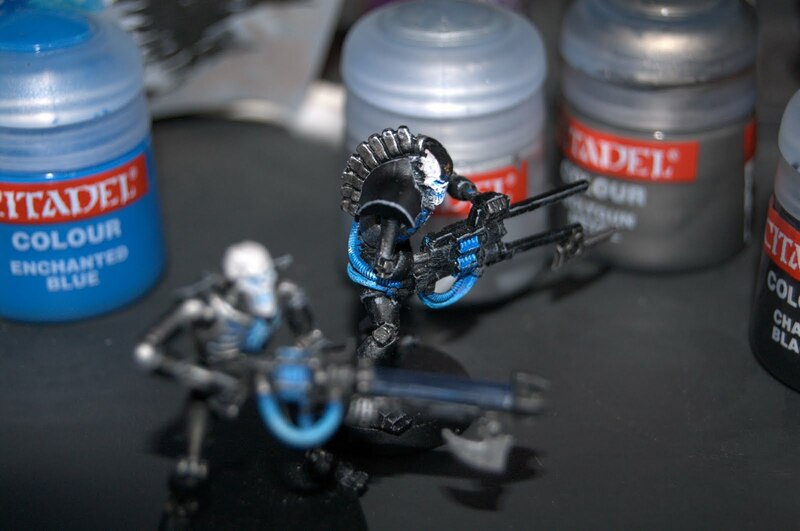 I only wish the "blue" replacement rods for the gauss weapons actually looked a little more blue. As it stands, they mostly look like clear glass but I don't mind that too much. 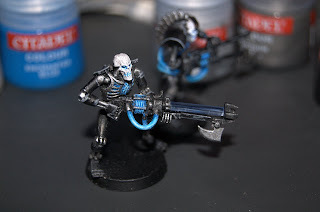 I'd still rather use these clear-blue rods than the green ones -- nothing against that color, I just feel it stands out a little too much and takes away from the rest of the model. I think I mentioned it before, but I picked these Necrons up from a friend who was getting out of the hobby, so everything was already assembled and most had a dark green primer applied. The models were in bad shape though, missing a bunch of bits. Even if I wanted to use the green gauss rods, only 2 models out of the almost 30 infantry actually came with them. All of the blaster gun ends for the Immortals were missing, so I'll need to take some time and press mold some of those, unless I can use the bits from the new plastic Immortals box (that's probably the better move since it looks like I'd still be able to make a squad of Deathmarks with the remaining bits). I haven't purchased any of the new Necron kits yet and I'd like to repair and paint the models I have before doing so, but it's hard since they have some really cool looking stuff. When I do start to pick up more units I'll definitely be going for a Command Barge, a box or two of Lychguard/Praetorians (not to make either but to convert up a couple Royal Courts), a couple Annihilation Barges (the unit is a steal for the points!) and maybe a few Ghost Arks (they look cool and they make your bread & butter troops a lot more durable with the Repair Barge and the Quantum Shielding). I'm really looking forward to their second wave release, especially if it contains plastic Wraiths which is easily in the top 3 of my favorite units in the codex. The recent FAQ has reinvigorated my interest in the 'crons and I've begun to do more list building with them. I'd really like to get a playable 1000 pts table-ready in the near future, but we'll see how quickly I can crank stuff out. In other news, it snowed! Finally! Instead of clearing off the cars (like I should have done) I took the opportunity to snap a few pictures of my recently completed Nightbringer out in the snow. 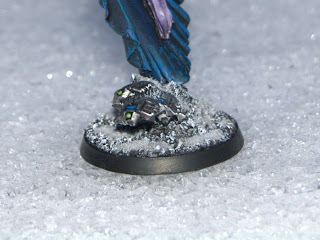 I'm going to try and get a squad of troops done this weekend so I can get a group shot of them in the snow with their snow bases. But not sure how far I'll get since there's a big game tomorrow. 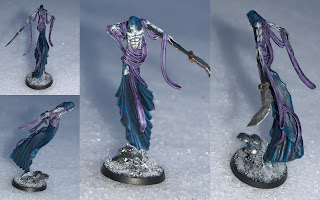 I'm usually not that into it, but you have to support the home team ;) The C'Tan knows, what do you think the purple is for ? 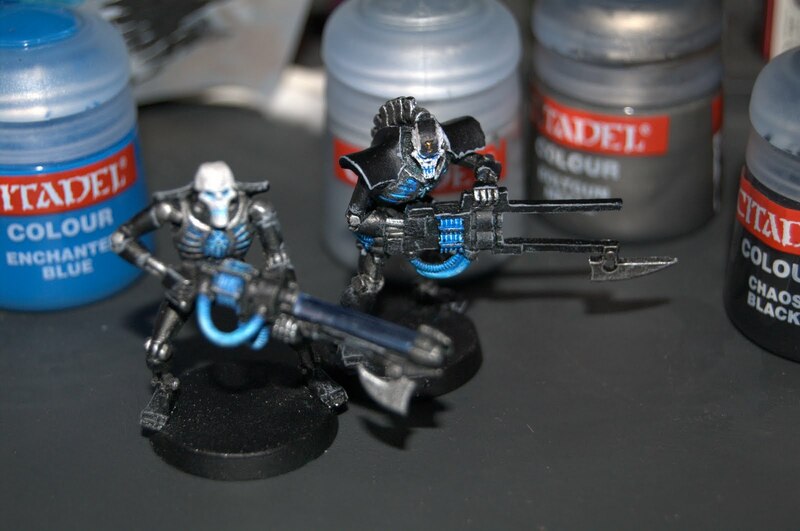 Old Citadel paints: Boltgun metal with Badab wash, Dheneb Stone with Skull white hightlights, Enchanted blue with Ice blue highlights, purple washes over stone basecoat for the drapes. Where did you get your blue replacement rods?